Kumi Tømmerbakke Løkeberg School has established a tradition of carrying out a Storyline in English in year 5. Norwegian pupils start English in the first year of school. By the time they are in year 5 Løkeberg pupils are often familiar with Storyline from using the method in other subjects. 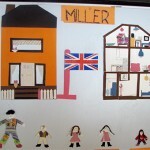 The Storyline used in year 5 is called Our Street and centres around families in a street in England. English customs and school life is a major focus. This year two teacher training students from University College of Oslo participated in the Storyline. As a finale to their work, year 5 invited guests who have worked with Storyline from a teacher training perspective from the University College of Oslo.